Submitted by Michael Lampert on 29 June 2011. 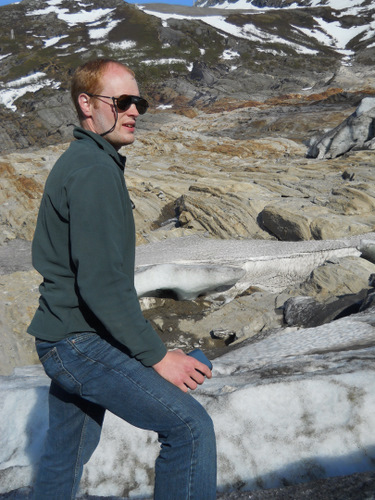 Today I hiked up to the glacier tongue with Knut and looked at the ice from close up. I was happy to get some pictures yesterday of the calm lake, which is a bit of a rarity because of the cold glacier near it. The winds from the cold air rushing down the slopes are known as Kadabatic winds (Greek for downhill), these are normal for glaciers because the cold air sinks to the lower elevations because it is denser. When it does this it kicks up a lot of dust which covers the end of the glacier with dirt. This can actually slow down the melting of the glacier by insulating it. Knut is kind to hike with me and teach me about the glacier, he has an amazing education and is a world traveler having been to all continents. His fluency in Norwegian and his technical background makes it clear he is on a college research career path. What I like is that he is very interested in bringing science to high school kids and is encouraging me to explore ways to have kids do field research. As we walk across the rock it is clear there is a waviness to the ground. Knut explains that he can pick this up with his radar and calculate periodicity in the rock. 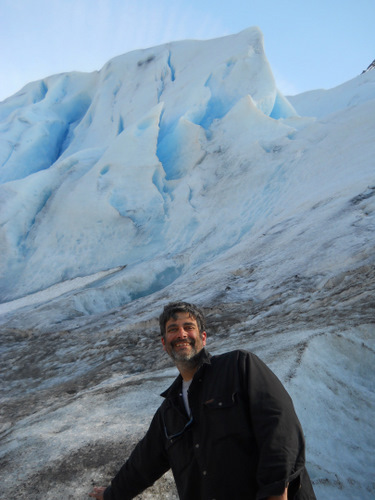 He points out the locations of his seismometers and explains that they are so sensitive that he can actually hear the pinging of the ice calving off the tongue. As we get closer to the glacier you can see an odd rock or two on top of the glacier, these are from rocks slides on the canyon wall, they are a bit unnerving because it is clear they can fall through the ice at any time. 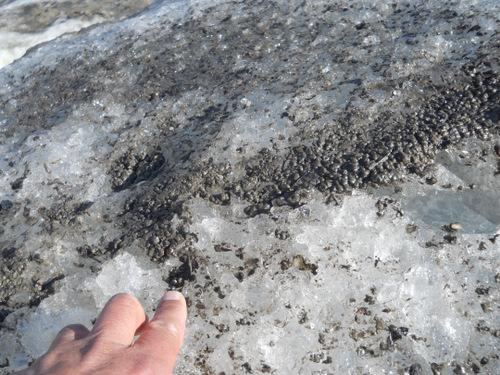 The melt water picks up throughout the day, this diurnal variation is common as the sun warms the ice. It is difficult to imagine that last week I was six hundred feet beneath the ice and this whole thing was sliding above me. It is a lot nicer to be on the outside. 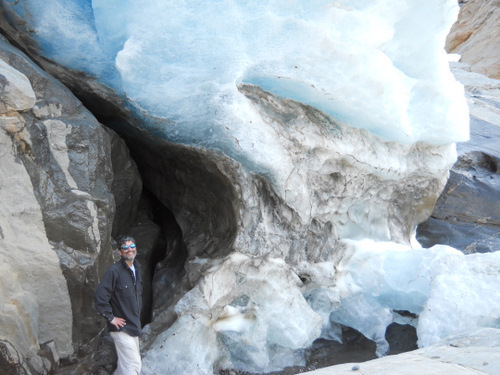 We reach the tongue and take a few pics, you should never stand under the glacier because it can calve at anytime. I do the stupid thing and stand next to it for the photo op and shiver a bit as a small chunk of ice smacks my backside. Enough to remind me that this is a stupid thing to do.... It is a very short hike to the glacier tongue, steep and well worth it, I wish I had the proper gear to go up higher. You can peer beneath the glacier when you are next to it. 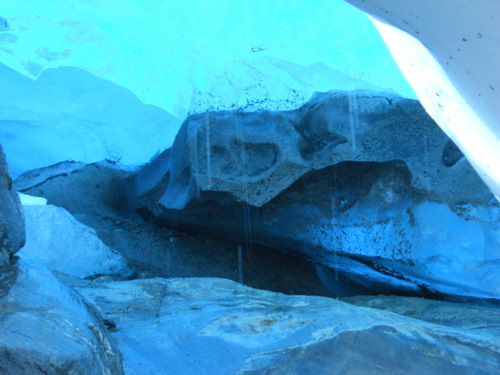 The melt water makes small caverns that are shielded by the snow above. The only light that can make it through the ice filter is blue light, so everything beneath it has a deep blue color. You can hear the running water beneath the ice. This chunk of ice is ready to calve off at any time, I imagine by tomorrow it will have fallen off. 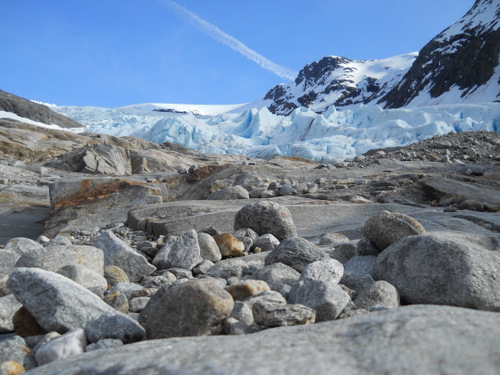 The glacier moves about a meter a day on top. It is not wise to stand here. 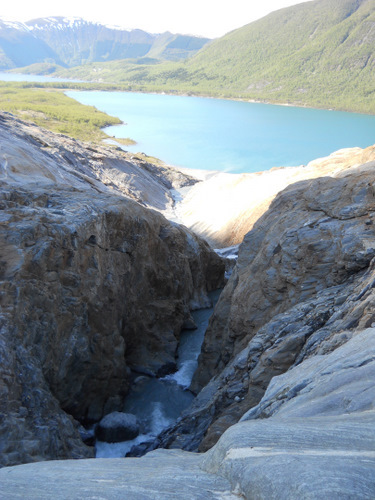 The ice that falls off the glacier goes into this canyon, melts and finds it way into the lake below. Knut is fluent in Norwegian and very technically oriented, his ability to do research is superb, I have really appreciated his enthusiasm to learn. Here you can see how dirty the ice gets from the debris it has brought forward and from dust kicked up by kadabatic winds. 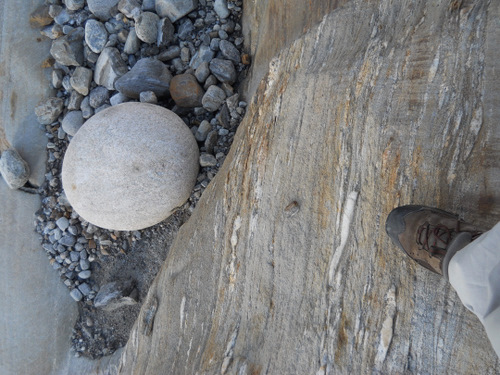 This round rock was caught in a pothole which it ground as it was swirled about from rushing water. I am in awe of the beauty that surrounds me. 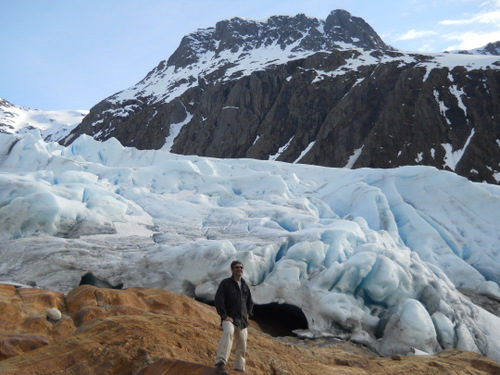 The glacier is very beautiful and a living science museum. These rocks likely were from a rock slide off the canyon walls, there is quite a bit of debris, however there is more clear smooth areas. 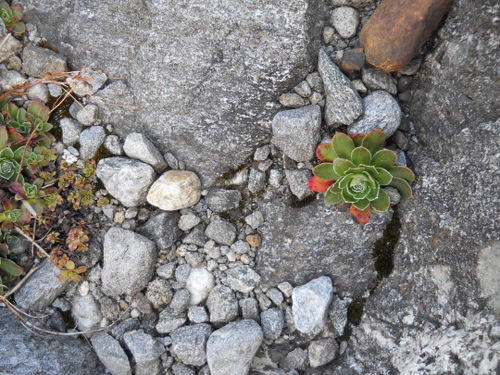 I am not a biologist or a geologist, but this plant reminds me of a similar plant we have in Oregon. 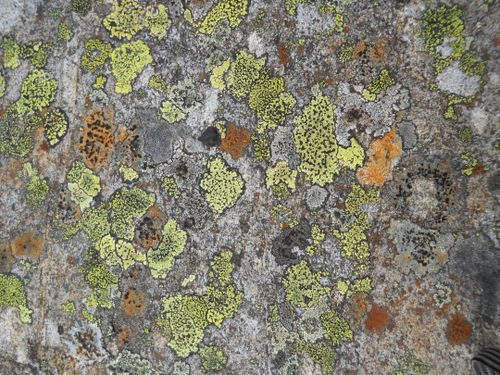 What a fantastic variety of lichen exists out here.